Hyster Forklift Parts - Hyster is an industry leader in the materials handling industry that has been in business for more than 80 years. However, it began as a manufacturer of lifting machinery and winches. Most of its production was concentrated in the northwest United States and dealt primarily with the wood and logging industry. A couple years after the first forklift trucks were invented Hyster became synonymous with quality production. 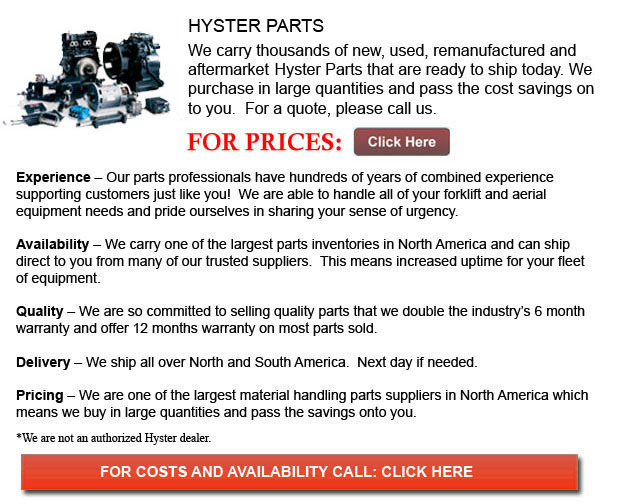 Over the preceding 80 years Hyster has continued to expand and grow its product line. The growth of its products coupled with its want to stay service oriented has allowed Hyster to develop into the global player it is nowadays. Through the 3 decades between the 1940's and 1960's, Hyster made considerable strides on its path to becoming the world leader in the forklift industry it is today. In 1946, Hyster opened a plant in Illinois that was totally devoted to bulk producing trucks. This allowed Hyster to force its expenses down and, simultaneously, offer a better quality product at industry competitive prices. In 1952, Hyster began its first foray in to the international production market through opening its first plant in the Netherlands. The Netherlands plant was originally designed to produce two products: Hyster 40" and the Karry Kranes. Hyster continued to aggressively expand its production operations all the way through the 1950's and 60's. They started constructing container handlers in the US in 1959 to meet with the ever expanding demand for transportation goods. In 1966, Hyster developed a method for enabling a lift truck to go both ahead and backwards using the same pedal. This pedal was termed the Monotrol pedal, which revolutionized the industry. Later on in the decade Hyster opened a R and D centre in Oregon that was focused on improving the design and functionality of forklifts. The centre is still one of the world's top testing facilities in the materials handling industry. In the 1960's Hyster experienced rapid expansion. Much of the manufacturing was shifting in the direction of bulk manufacturing. To keep up with the times Hyster was inclined to concentrate on the evolution of these mass markets. Accordingly, in 1970, the XL design philosophy was born. The XL design philosophy allowed Hyster to offer superior quality at a more reasonable price. A further expansion in manufacturing capabilities was necessitated by the need in Europe for Internal Combustion Engine Trucks. To fill this hole, a plant in Craigavon, Ireland was opened in 1980. Through the eighties Hyster continued to focus on developing industry leading lift trucks. The Hyster company name was known throughout the world for its dedication towards superiority. This attention to quality brought a lot of suitors for the enterprise. In 1989, a large multinational business based in Ohio called NACCO Industries purchased Hyster and started an aggressive growth strategy. NACCO rapidly replaced the XL philosophy with a more driver oriented truck that concentrated on operator comfort, which is recognized as the XM generation of lift trucks. The evolving needs of Hyster's consumers, led by changes in supply chain management, required Hyster to continuously innovate and invest in new manufacturing technologies throughout the next few decades. Acquisitions and investments were made in the US, Italy, Netherlands, and a lot of other places all over the world. All of these investments have made Hyster a worldwide leader in the forklift market. Recently, Hyster celebrated its eightieth anniversary as an industry leader of materials handling equipment, which includes more than three hundred various models of forklift trucks.